Ecologists and Farmers. Pioneers of a Restored Planet. Losing 90% of its population from its 20-year average, Monarch butterflies are at risk of extinction. On one end of their 2,000-mile migration, cornfields have displaced most ofAmerica's prairies along with the milkweed plants that monarchs breed on. On the other end, deforestation threatens their overwintering grounds Michoacán, Mexico. 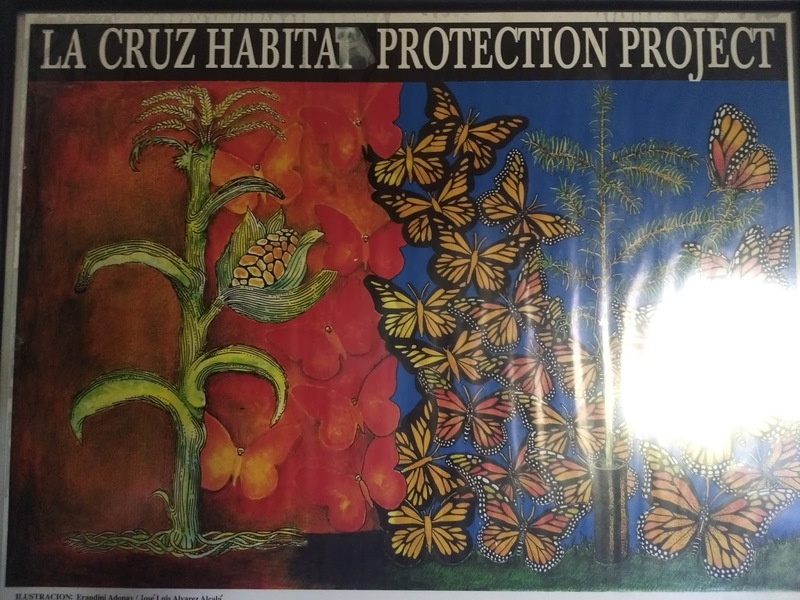 Taking action on behalf of this natural icon is La Cruz Nursery. 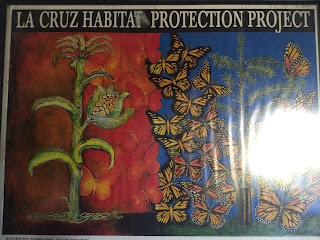 ...is dedicated to protecting the monarch butterfly and other endemic species by reforesting the land surrounding the Monarch Butterfly Biosphere Reserve, and to promote sustainable forest management among the local landowners for their economic benefit and forest conservation. 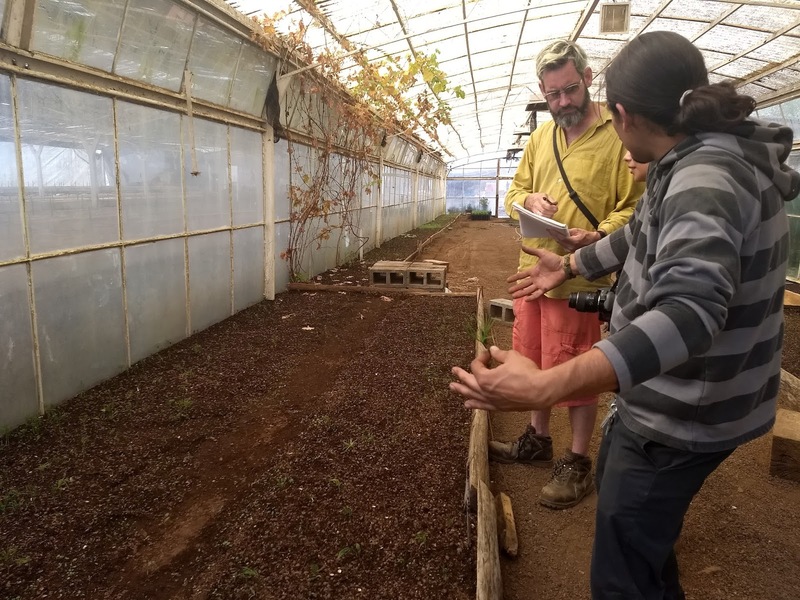 La Cruz also supplies tree seedlings for a wide range of reforestation initiatives. 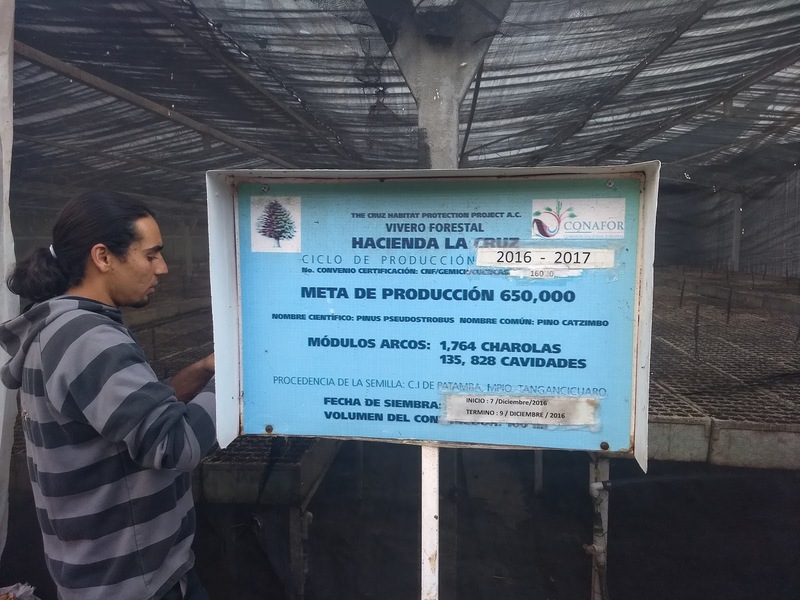 When we visited (December 7th, 2017) the nursery was growing 650,000 trees, Luca said, including 250,000 for Conafor, the National Forestry Commission, who's reforesting 15,000 acres in 2017 in Michoacán alone. 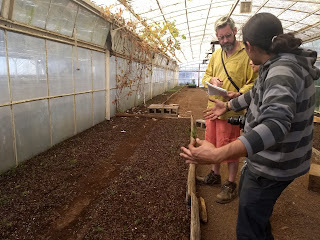 [link Conafor project: Reforesting for Community (coming soon)] It's overall goal, La Cruz Nursery "works with different reforestation projects in areas damaged by humans or nature, to protect and restore local fauna and flora." Avocado plantations – While important to the state economy, avocado farming displaces 345,000 acres of forest in Michoacán. 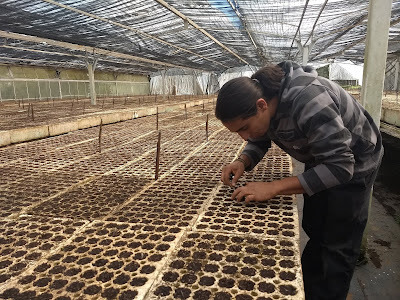 The state government therefore, urges cooperation from avocado growers in reforestation, on 160,000 acres according to one official, who said in 2016 that seed collection and nursery efforts must be intensified. Highways – Rows of oaks help beautify Michoacán's highways and sequester carbon. 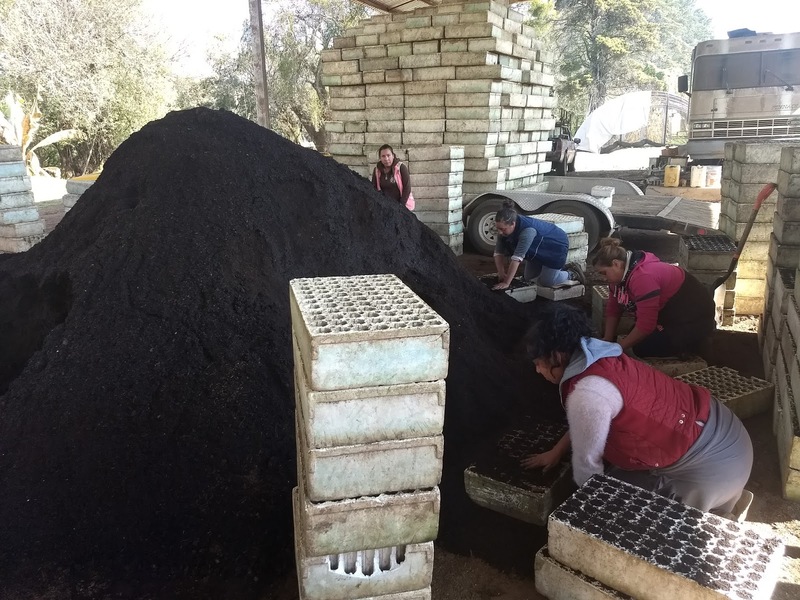 Lake watersheds – Reforesting around Lake Zirahuen and Lake Patzcuaro will help regulate rainwater runoff and slow erosion. Scientists predict these lakes will disappear in 20 years and 5 years, respectively, due to siltation and deforestation of the watersheds, according to Luca. Christmas trees – Locally grown trees are less likely to transport pests and cost less to both the environment (less fuel to transport) and the consumer (300 pesos compared to the 500-600 pesos for imported trees). This income from the holiday season helps fund the other reforestation projects. La Cruz is devoted to sustainability. Fertilizers are all organic: bat droppings, fermented vegetation, and vermicompost (worm droppings). Seeds are locally sourced, and the nursery provides meaningful employment to the community. Education and outreach is another objective. 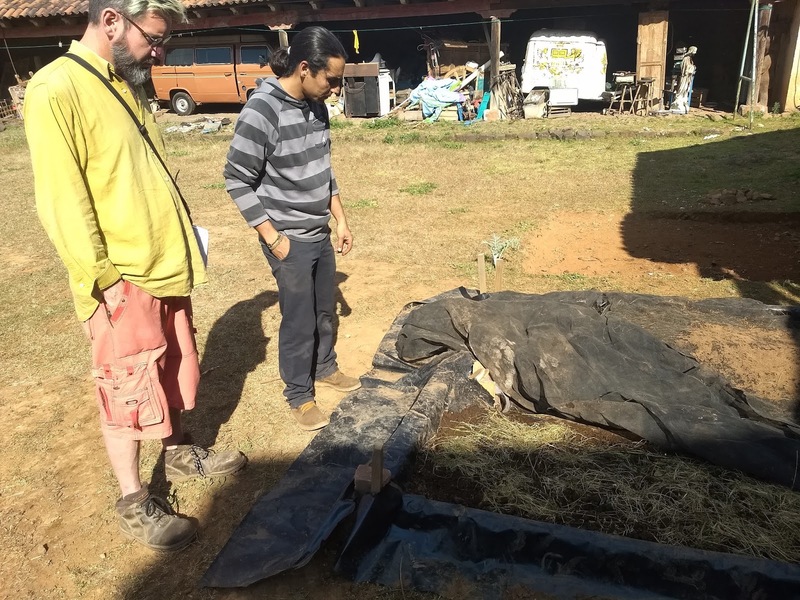 Luca teaches organic gardening to local communities, as well as reforestation methods. Donate to Forests for Monarchs. According to Luca, from seed to 18 months of nursery care to transport to planting, each tree only costs one dollar. You can also shop for them or join their email list. Purchase trees directly from La Cruz Nursery and follow Hacienda de La Cruz on Facebook. Sue Sill, "Reforesting Michoacan: Small communities in rural Mexico restore Monarch Butterfly Habitat," American Forests Magazine (Winter, 2009). Forests for Monarchs (official website). 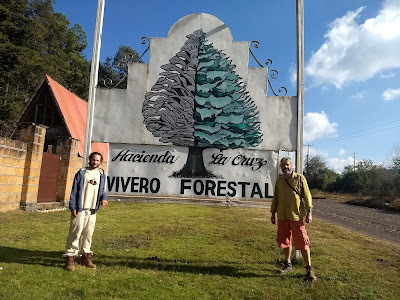 Hacienda la Cruz, Vivero Forestal (official website). "Michoacán, líder mundial en producción de aguacate," El Economista (June 25, 2017). 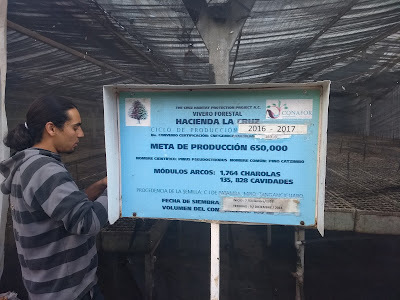 Oscar Esquivel, "Piden a Aguacateros trabajar en Reforestacion," Cambio de Michoacán (Feb. 15, 2016). Copyright © Next Succession. Simple theme. Powered by Blogger.